The UK is set to produce its fourth Open Government Action Plan that will run from mid-2018 to mid-2020, as part of the Open Government Partnership (OGP) initiative. 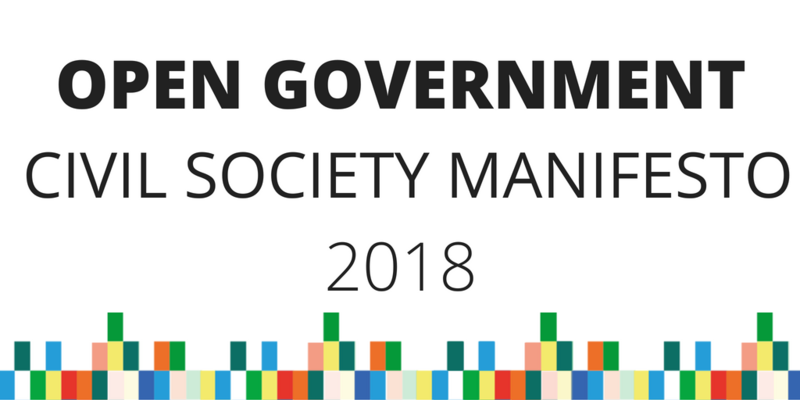 This Manifesto puts forward the UK Open Government Civil Society Network’s key thematic areas for consideration as part of the development of the UK’s fourth UK Open Government Action Plan. The Manifesto has been developed following discussions by civil society; an online portal to suggest ideas, meetings and workshops in seven cities focusing on UK-wide commitments, as well as a conference in Northern Ireland. These have brought together over 40 ideas for open government reform. Open Government Networks in Scotland, Northern Ireland and Wales are also holding meetings to develop proposals for commitments by their devolved administrations, as well as to inform UK-wide proposals. Scotland in particular will be developing its own Open Government Action Plan as part of the OGP Local Program. This next UK Open Government Action Plan should build on substantial progress made on previous action plans, including by bringing greater transparency to government contracts, grants, extractives payments and beneficial ownership information, and making the most of data to be used to deliver better public services. Yet Government and civil society should not avoid making sure the Action Plan addresses some of the substantial challenges facing the United Kingdom; whether it be around the future of the NHS and adult social care, the state of public sector outsourcing after the collapse of Carillion, the lack of transparency in the financing of political campaigns and UK political parties, the corporate abuse of personal data or the impact of continued austerity, just to name a few. The UK faces a period of dramatic institutional change. We believe the principles of open government – transparency, participation, accountability – must form the basis upon which the UK becomes an improved and more modern democracy. Follow the money in government: Transparency of government budgets, grants, contracts and spending are central to the delivery of public services and scrutiny of spending. Law, participation and policy: More open decision-making processes where citizens can participate effectively will help government and parliament make better decisions. Strengthening accountability and anti-corruption efforts: Accountability mechanisms at the national, local and global level need modernising. The UK must tackle illicit financial flows and build on its work to increase transparency of aid, the extractives industry, and beneficial ownership data. Building open data infrastructure for action: A public data infrastructure will support good governance and innovation, but it must also respect privacy and citizen rights. Access to budgets, grants, contracts and spending by central and local government are central to monitoring the delivery of public services. Yet too often the processes and money allocated and spent remain opaque, hard to scrutinise, and even harder to engage with through existing citizen participation mechanisms. In other Open Government Partnership member countries, it is possible to follow the money from budget, through contracts and grants, to payments. Access to information which enables the identification of the companies and charities in receipt of money to deliver services can be used to support strategic decision-making and monitor the impact of policy and spending. It can also help to better stimulate local economies and enterprise, and enable small and medium-sized businesses and charities to access funding opportunities. Building on successful advances in a number of Departments, we call for all Central Government Departments to now publish full budget, contracting, grants and spending data in standard open data formats. Existing open data standards should be used where they are available, including the Open Contracting Data Standard, 360Giving Standard and IATI Standard. Central government should provide clear leadership to support good practice to be expanded to agencies and local government. This should encourage adoption of open data standards and structures for publishing budget, contracts, grants and spending data and documents. Furthermore, local initiatives should be encouraged which support building the capabilities of data users in the third-sector and in local journalism to make the most of advances in local open contracting and budget transparency. The UK should draw on tried and tested use of Participatory Budgeting in policing, health, local government and voluntary, community and social enterprise (VCSE) organisations, and extending that practice into the mainstream budgeting process of both national and local budgeting. We call for central and local government to use joined-up and non-proprietary company/charity identifiers in all procurement and grants datasets, clearly linking between budget, contract, grants and spending datasets. The Contracts Finder platform should be extended to provide a register of contracts, as well as awards, and to support monitoring of contract implementation. Furthermore, contracts and documents related to contracts or grants should be linked to relevant datasets. More broadly, the delivery of public tasks should be covered by the UK Freedom of Information Act whether the work is carried out by the government, charities or the private sector. Open Government is not just about transparency: it is about the way law and policy is made. Improving policy and legislative processes so that they are more open to effective citizen engagement, without being at risk of undue influence or hidden private interests, requires action from both parliament and from government departments. As the UK is scheduled to leave the European Union, it is an opportunity to ensure the UK’s democratic system is modernised to bring it into the 21st century. In line with the recommendations for the Independent Review Mechanism (IRM) report, we call for a Parliamentary Select Committee to explore cross-government progress on transparency and participation in policy making, and to provide the guidance and leadership needed for government to maintain transparency and participation event for tough decisions. We also support the recommendation in the IRM report for greater information to be made publicly available on the effects of Brexit on everyday life, to enable greater public understanding of the potential consequences and trade-offs in order for the Government to secure a deal that has the support of the British people. Furthermore, government should work to ensure clear and timely access to information on draft and enacted secondary legislation via legislation.gov.uk. With the passage of the EU Withdrawal Bill, it is essential for citizens to be able to access laws and changes to laws in a timely manner, to have a clear understanding of the law that is currently in force. We ask that the Government step up its commitment to open government by introducing greater levels of transparency and openness in Brexit preparations and negotiations. At a minimum this would entail matching the levels of transparency of the EU during the negotiations, by increasing the number of related documents disclosed proactively and dramatically improving the Department for Exiting the EU’s performance on responding to Freedom Of Information requests. Law and policy making need to be more transparent in order to also help public participation. Recognising the £2.5bn invested by government in policy-relevant research every year, we call for a proactively published register of government-commissioned research. Furthermore, the evidence for policy formulation and evaluation should be made transparent. As Government invests time and resource towards decision support tools using machine learning and AI, it should also commit to ensuring that such tools demonstrate compliance with the Principles on the Rule of Law, as identified by Lord Bingham. The process of policy making needs improving. We call for the government to develop more effective consultation practices, including ensuring single points of contact to collect evidence as part of consultations. It should also invest in piloting open policy-making approaches to identify best practice, especially where this directly engages children and young people in a meaningful way. Other areas of government decision-making could also be opened to greater public participation and input, such as in the development of contracting processes and criteria. Furthermore, the government and parliament should explore new ways to engage with citizens including options beyond the consultation model, which may include practices such as deliberative or direct forms of democratic decision-making. At the local level, much can also be done to increase accountability and improve citizen participation. Local council meetings should be made more accessible to the public via live-streaming, and ensuring timely and open formats for minutes. Local decision-making processes should also be improved, such as by proactively publishing Equality Impact Assessments and demographic data of contributions to local consultation processes, and including recommendations for improvement as part of feedback. Local authorities should trial and adopt new ways of engaging their residents, including participatory and deliberative public engagement, in decisions about their local community and public services. Obligations around local governance and engagement should to some extent also be mandated in devolution agreements. The UK has a mixed record on anti-corruption. Although the government has played a global leadership role in aid transparency, extractives industry transparency, and beneficial ownership transparency, our financial system is still used to launder billions of pounds in the proceeds of corruption. Our democracy should seek to serve the public interest. Companies, charities, political parties, campaign groups and other institutions all have a key role to play in shaping public discourse, but their role and activities must be transparent to make sure interests are clear, and that everyone operates within the rules. Government should build on recent progress in natural resource sector transparency, closing the gaps in current mandatory payments to governments reporting regimes. Given the UK’s position as one of the world’s foremost commodity trading hubs, with major traders such as BP, Glencore, Lukoil and Shell registered and/or listed in the UK, it is now time to build on previous work and for the UK to commit to including payments to governments for the purchase of oil, gas and minerals (commodity trading) within its mandatory disclosure regime. The UK should also introduce clarificatory guidance for the Reports on Payments to Governments Regulations 2014 where needed. It should create a single open data repository for reports by UK-incorporated and UK-listed extractives companies, as well as extending the reporting regime to extractives and natural resource trading companies listed on the AIM market, and ensuring the Overseas Territories and Crown Dependencies introduce equivalent mandatory reporting regimes. The UK Government should also extend the existing transparency of UK tax incentives and reliefs to enable greater monitoring and periodic assessment, ensuring parliamentary and public awareness and trust in the UK regime, and ensure value for money. Such tax transparency, building on Country-by-Country reporting requirements, should look to ensure access to open data on the share of UK tax paid by any firms doing business with the UK government. Recent revelations have found secret loans with complex or burdensome guarantee clauses are contracted by governments across the world under under UK law. As these secretive loans undermine development, we call for action that would mean such loans are only enforceable under UK law if published in a central and publicly-available register. To demonstrate and monitor the impact of anti-corruption efforts, we call for UK authorities to publish clear data on an annual basis about assets linked to grand corruption that have been frozen, seized or confiscated in the UK, and assets that have been repatriated. To encourage good business practice and avoid government entering into business with companies of questionable practices, the Government should also establish a public register of corporate convictions and fines, linked to the OGN’s proposals on greater transparency in UK courts, below. We want to see continued work on public registers of beneficial ownership – strengthened by the vote in parliament to require British Overseas Territories to bring in public registers revealing identities of companies formed there – including the introduction of a public register of the real owners of overseas companies that own or buy UK property or bid for UK Government contracts. The Department for International Development has played a leading role in the International Aid Transparency Initiative. Building on this, we call for continued work on aid transparency across government departments to ensure that all Overseas Development Aid is disclosed using the IATI Standard to support both scrutiny of spending and effective aid coordination. Government should also look to reduce opportunities for corruption by public officials. A single, searchable and filterable register of meetings between Ministers and Lobbyists should be published, and the publication of meetings with UK Ambassadors should be considered. Information on attendees and sponsors of All Party Parliamentary Groups should be published in standard machine readable formats, agreed with civil society, and should be published as close to real-time as possible. Finally, the principles of the Open Data Charter around structured and interoperable data should be applied to the Commons Register of Members Financial Interests, and to interest and asset declarations at all levels of government. We call for the creation of a common data standard for interest declarations, and for its adoption in Parliament. Open data is essential for ensuring accountability. The creation of a universal public data infrastructure, supporting good governance and innovation, whilst respecting privacy and citizen rights needs ongoing dialogue between government and citizens. Striking the right balance in the responsible use of data requires public engagement and conversation. We call for improvements in the discoverability and standardisation of government open data. Improvements, such as to meta-data on the contents of datasets and better search tools, will make it easier to bring together all published government data about a particular country, company or issue. This also means that a citizen should be able to request and receive information on how their individual level data has been used by public services. All uses and flows of a citizen’s individual level data within and out of a department/body should be securely and sensitively collated, and made available to a citizen in a secure and confidential digital manner. A public data infrastructure should cover all branches of government, including the courts and parliament. We call for access to information on the delivery of justice, and on our case law which should be accessible to all without charge, including online court listings, summary documents, and judgement information published online and open by default. Parliament should ensure data and information held, is available to the public in an accessible and timely manner. The Government should work closely with business and civil society so that the broader use of data by third parties can be made easier and more effective, stimulating growth as well as the protection of human rights and transparency in supply chains. The government should ensure that open source options are the default requirement for government software, unless there are specific circumstances where this is not possible. The government should continue to engage with civil society in improving the publication of corporate gender diversity data so that more disaggregated data can be collected and published. Data should be collected and published on the diversity of electoral candidates and elected representatives as per section 106 of the Equality Act 2010.